The Homemaking Chronicles: Gallbladder Attack? Try This! So, I saw Dr. Oz the other day, like I said in a previous post. I turned him on again today and was talking about gall stones, which reminded me of a time when I was pregnant with baby #3, and I had the worst pain. I didn't want to breathe because every time I moved, it would get worse. Being pregnant, I couldn't really do much in the way of pain relief, but I can tell you at that moment, I thought the pain was so much worse than labour. I had never had that pain before, and didn't know what it was. Superman went online, came back with a pickle in his hand, and told me to eat it. He said he thought I was having a gall bladder attack, and that the pickle was supposed to help. It totally worked! I could breathe again. I don't know the science behind it, and I have never had another attack to test it out again, but it was such a relief that night. 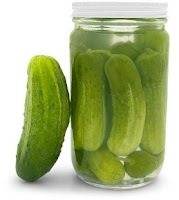 I don't know that this is common knowledge, so I thought I'd share it for you to put in the recesses of your mind in case you ever get a sharp pain in the right side of your torso that won't go away--it may be from your gallbladder giving you grief, and a pickle might just do the trick! Gallbladder getting you? Eat a pickle! I had "minor" (more short-lived than minor) gallbladder pain after giving birth to my first. Pregnant and having issues with my gallbladder this second time around. I've read a couple of "What to Eat" pages today, and all have vinegar and cucumbers on their lists.